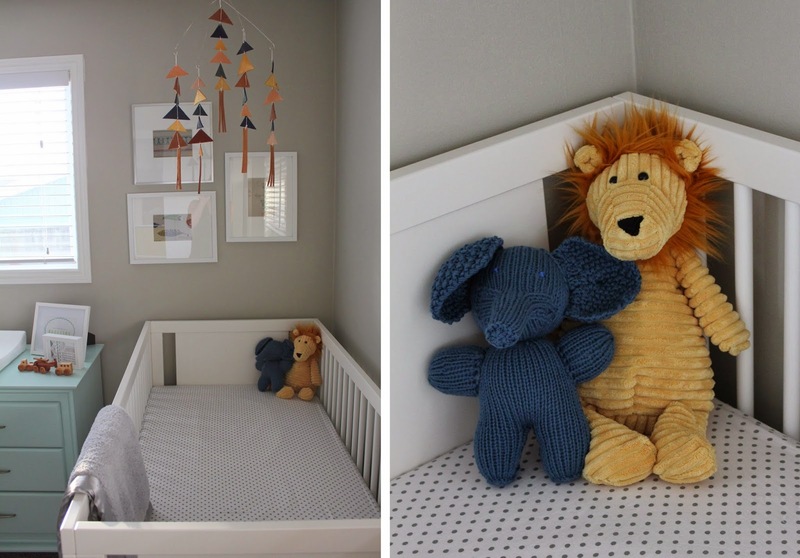 Jackson's nursery was completed in large part due to the generosity of our family and friends who gifted us with so much! We are blessed and thankful to have been gifted with so many beautiful pieces that helped shape this room. The "hand me downs", purchased items and hand made gifts from family and friends are all so appreciated. 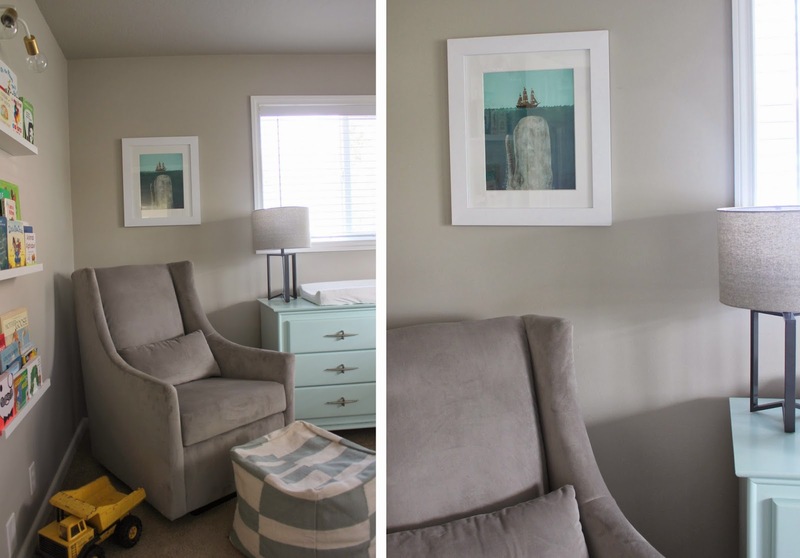 I cried when my work gifted us with that awesome glider chair! Jackson is well loved. 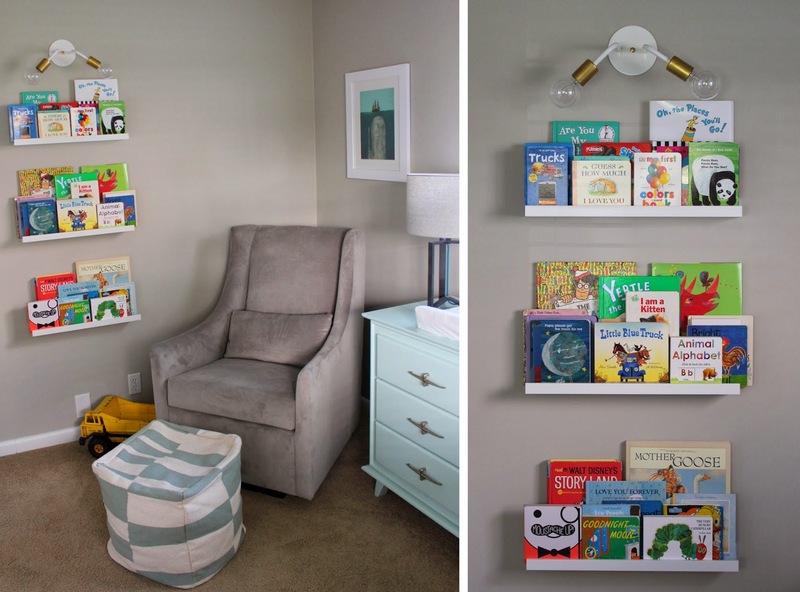 I really enjoyed dreaming up a nursery for our little guy and was excited to start from scratch on designing the space. 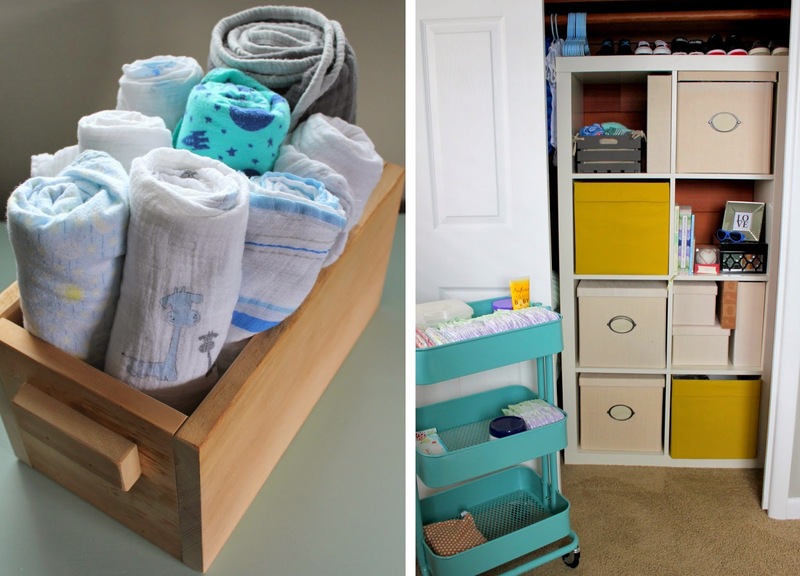 I wanted to keep it simple and gender neutral so that I can re-use all of these items in the future if we are to have a girl. Listed below are the resources for almost everything shown in the photos above. Thank you to everyone who generously provided gifts for Jackson! I love how simple and easy this home-made toner is and wanted to share... Enjoy! SAND: I liked the color of the door as-is, but wanted to give it a bit of rustic look so I lightly sanded the edges (and probably exposed myself to lead). Is that why I felt dizzy afterward? CLEAN: I wiped down the door to remove the dirt, cob webs and sanding dust. TOUCH UP: The edges of the door did not match the white of the front and since they are going to be exposed, I used a can of white paint that we had to paint the edges. 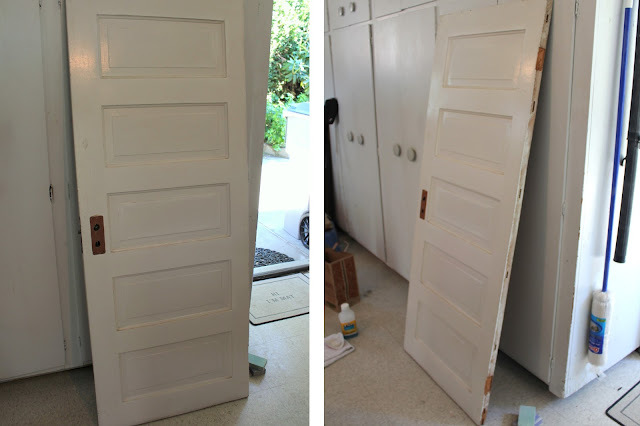 Next, I had to decide how to turn this door into a headboard. I considered using a french cleat, but didn't feel like going to the store or spending money so I wandered around our garage looking for something to use. Luckily, we have been remolding our house so we have all kinds of trinkets lying around. I found a few pieces of particle board on the side of the house and figured they were most likely not needed for anything. I somehow managed to move the headboard inside without nicking a wall or scratching the floor! I leaned the headboard against the wall and pushed the bed up against it so "secure" the headboard in place. 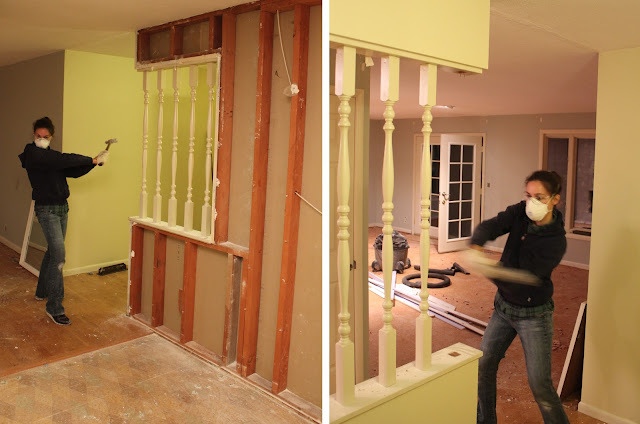 *Once the headboard was in place, it seemed a bit high and I wanted to use a stronger wood so I switched out the particle board legs with 1x3 pine. I shortened the legs by a few inches so that the bottom of the headboard rests at the top of the mattress. Much better! Every year I struggle with what to get people. I want to pick out the perfect gift, but I also am tight on money and don't want to break the bank. This Christmas season I really focused on showing GRATITUDE instead of getting caught up in what to buy people. I want to bless people that mean the most to me, but how do I do this? Sometimes the perfect gift isn't a gift at all. This year, I focused on using the gifts and talents God has blessed me with. I know a lot of your bloggers are camera savvy/photographers. Offer to take family pictures for free! For those of you just starting out, this is great practice. 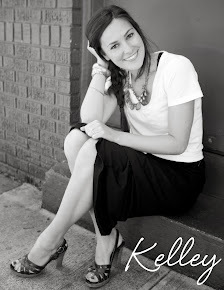 And for those of you who are a little further along, you can do a mini session. I did this for a couple of people in my church and it was one of the best experiences I have had. It was such a blessing for these families and they were so excited not only to have a nice picture to include on their Christmas card, but the option of printing some out for presents to grandparents. I was BLESSED to be able to use the gifts that God has given me to bless someone else. In all my years of given presents, I can honestly say that this was the best gift I have given. 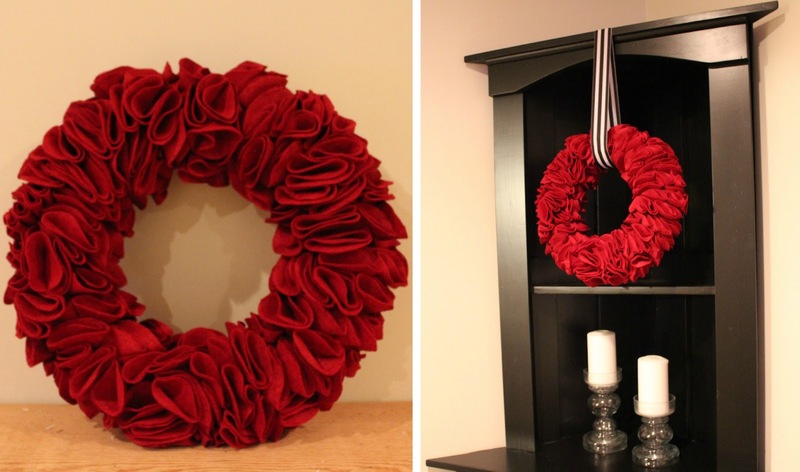 To read the rest of Susan's gift ideas, head on over to her blog! Tis the Season for Gratitude: a series dedicated to spreading a little bit of joy and gratitude around blogland during the holiday season. A reminder that a grateful heart is what this season is all about! We would love for you to join in and help spread holiday cheer as we focus on the true joys of this season. Also - please say hello to the other bloggers joining in on this series: Denise, Susan and Sheila! This is the 2nd Tis the Season for Gratitude post - a series dedicated to spreading a little bit of joy and gratitude around blogland during the holiday season. A reminder that a grateful heart is what this season is all about! We would love for you to join in and help spread holiday cheer as we focus on the true joys of this season. This project has shown me the joy that can come from a simple crafting session with a good friend. My suggestion this holiday season is to skip the crowded happy hour with friends and instead do something creative together. It can be refreshing to slow down and focus on the little things - especially this time of year! Thank you to all of our family and friends who helped make our house a home. We are forever grateful for the love and support that each of you helped pour into our home! This past Saturday Matt and I began our search for Halloween costumes, just hours before the party. We seem to wait until the last minute every year! I could have made my life easier and purchased a packaged costume, but this was not the Halloween party to do that. Everyone sports a homemade costume. In addition to making my own costume, the next guideline was to create this costume on a budget - because who wants to throw down a bunch of money on a costume? Once I decided on the Black Swan as my costume, I knew I needed a black tutu. I thought about making my own tutu, but realized I didn't have enough time. In desperation, I attempted to try on a child size tutu from Target. As I entered the dressing room, the saleswoman wished me "good luck." No such luck. I eventually gave in and went to the costume store where I found a tutu for $20. This was the big ticket item of the costume. Everything else was under $5 each. 1. Use Super Glue Gel to secure the feathers to the upper left side of the tank top. Overlap the feathers by starting at the top center and continue to layer by working your way down and to the left. 2. Spray the tiara with black gloss spray paint. 3. Use white face paint to cover your face, ears and neck. 4. 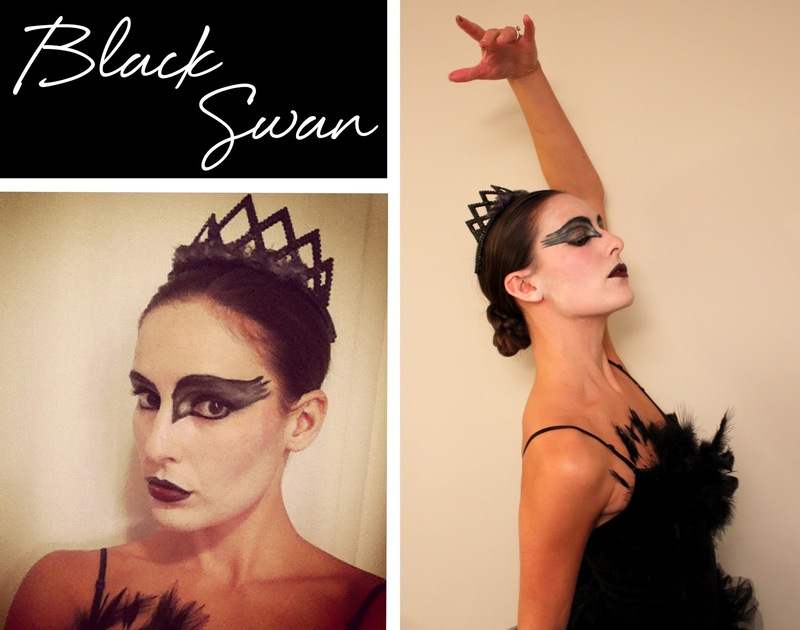 While looking at a photo of the Black Swan (try this one), use a black eye pencil to create the dramatic eyes. I then used a shimmery white shadow to highlight parts of my eye makeup. 5. Line lips with black pencil, apply dark red lipstick and smudge the two together. 6. 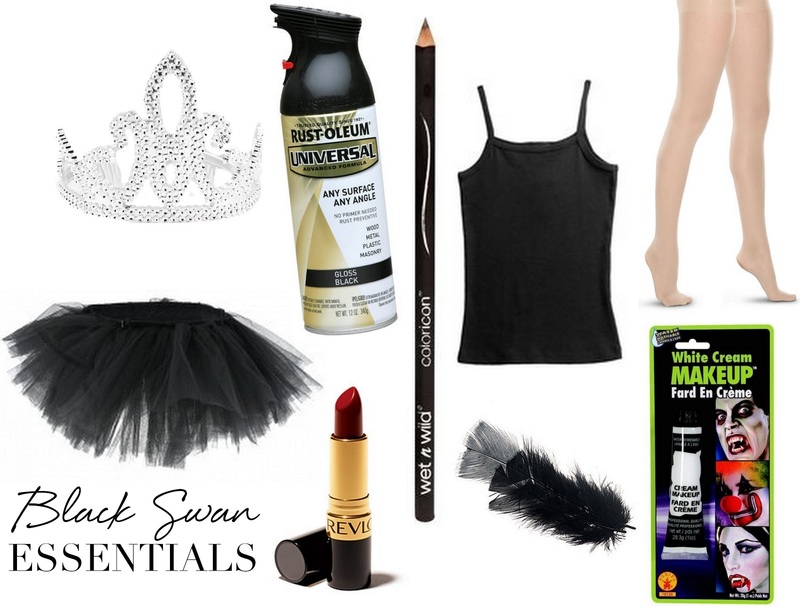 Now put on sheer white tights, feathered tank top, tutu, ballet flats and finish with the tiara - you are now officially the Black Swan. Be sure and pose accordingly. On another DIY costume note, Matt went as Jack Skellington from The Nightmare Before Christmas. The long coat he is wearing was found at Goodwill - in the women's section! We cut it to give a raw, jagged edge. Matt made the "bat collar" himself from a sheet of foam. Impressive, right? Despite my professional ballerina pose, I am not a ballerina. Although, I always wanted to be. 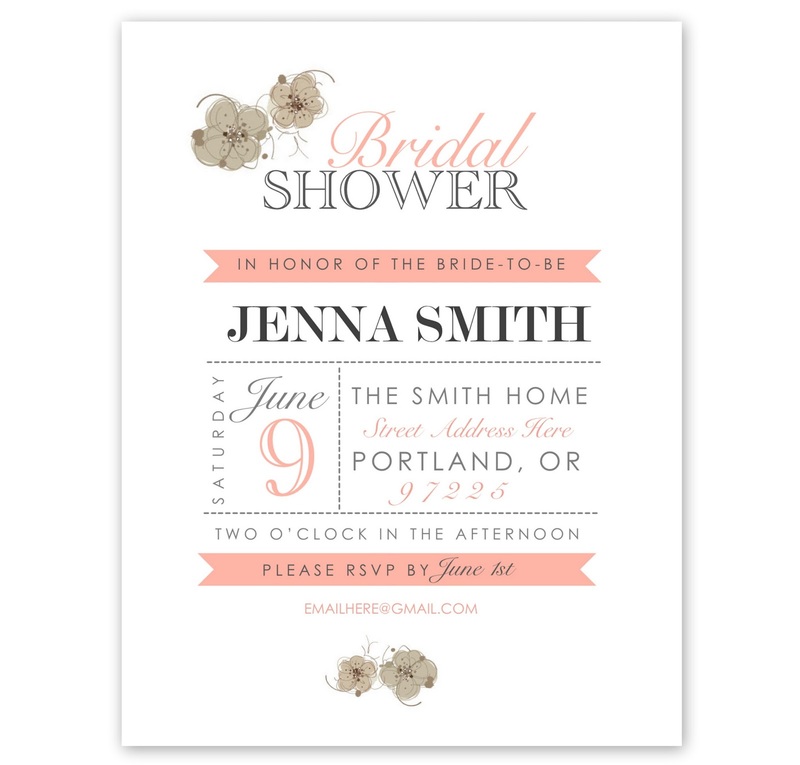 I created this flag banner for the bridal shower I hosted, with supplies that I found around the house and only had to spend a few dollars on what I didn't have. This is an inexpensive and quick way to add a fun detail to any party! Now, this is extremely complicated so please pay attention! 1. 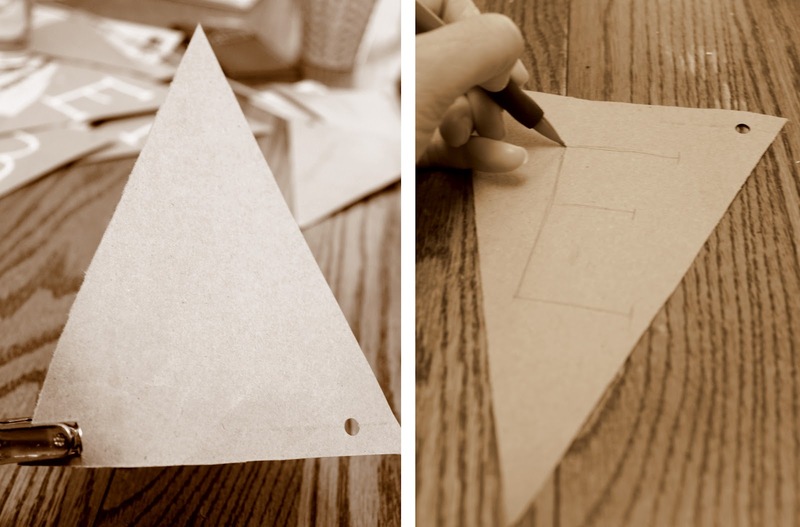 Use the straight edge of a ruler or book to draw a triangle on the inside of a paper bag. I used the length of my hand for size - so professional! Then cut the triangle out. 2. Punch two holes about 3/4 of an inch in from the corner. 3. Use the pencil to lightly write out each letter. 4. Use your white media to trace over the pencil and make it look nice and pretty. 5. Repeat for each letter. 6. I used a "heart" flag for in between each word. Draw a heart with pencil, trace over it with glue and sprinkle on the glitter. I suppose you could also use glitter glue! 6. 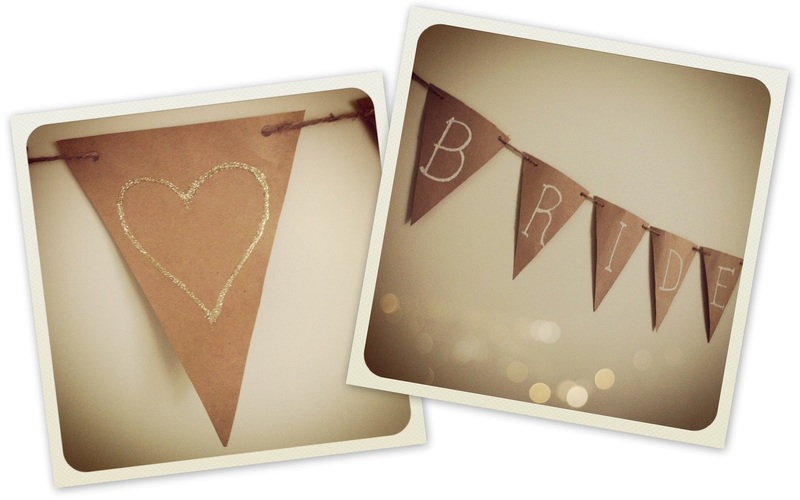 Once the glue has dried, string the twine through each hole and hang up that pretty little banner for all to see! 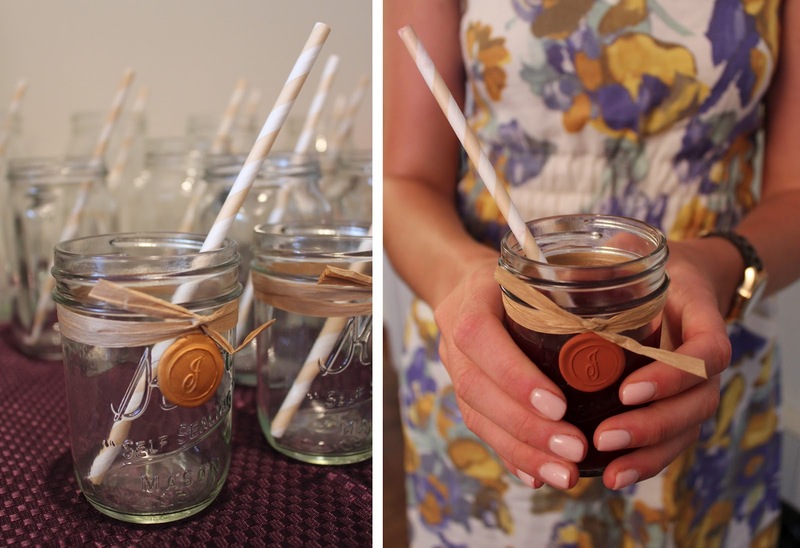 I had the privilege of hosting a bridal shower for my sister-in-law this weekend! I thoroughly enjoyed "geeking" out on the details - DIY flag banner, flower arrangements, fun appetizers and yummy sangria. The adorable "J" embellished mason jars were created by a family friend ("J" was for the bride-to-be, Jenna). 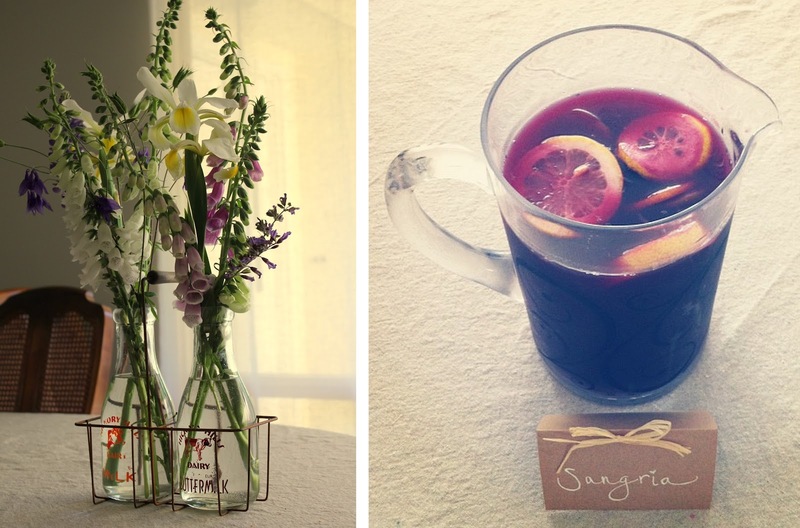 Simply add a striped straw, then sangria and you've got yourself a delicious drink! 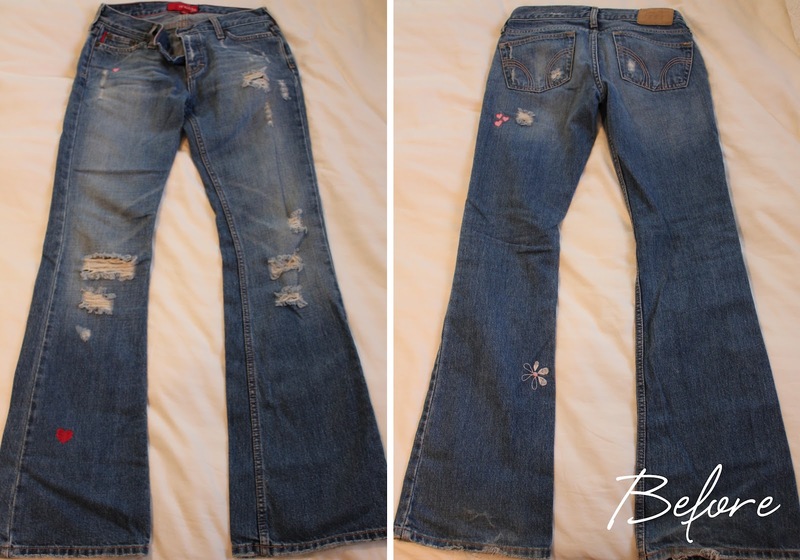 While cleaning out my closet this past weekend, I came across a pair of old denim jeans that I haven't worn in years. They still fit, but I wasn't liking the holes in the knee area so I decided to cut them off into denim shorts. I turned the denim jeans inside out and started cutting from the inside, at a slight upwards angle. I didnt' want to cut them too short, so I purposely cut a bit longer. Be sure to avoid cutting the pockets! I then tried them on and adjusted the length accordingly. Lastly, I ran them through the washer and dryer to give the fresh cut edges a more worn in look. It sure feels good to re-purpose old jeans and avoid buying new cut-off shorts!